On a trail, to leash or not to leash? 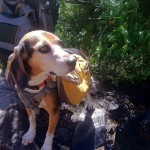 Few issues get hikers more stirred up than what to do about dogs on trails. The recent hub-bub (ado? fever?) about the proposed new rules to tighten leash rules in some of the Golden Gate National Recreation Area is a perfect example. The rules would require that dogs be on leashes in areas of the park where they can now run around, and they would be off-limits entirely in many other areas where they are now permitted. For the next three months, the federal government is asking people to comment on the proposed rules, and this being the Bay Area, the commenting – at least on discussion boards, blogs and trails – has been hot and heavy already. And there will be a handful of public meetings in the first week of March where you can show up and discuss it. 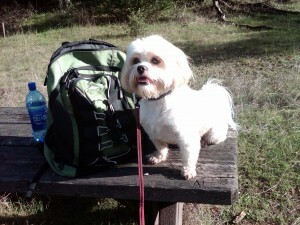 I’ve seen dogs on trails many times, sometimes as part of my hiking group and sometimes from other folks. Generally, they’re a positive part of the experience, and I like having them around. For one thing, they scout out what’s ahead, either by running back and forth on the trail or sniffing around and alerting us if there are snakes or other animals around. Also, it’s probably a great outing for the dogs, many of whom are stuck in apartments or small houses for much of the time. I can see though why some aren’t too happy to see them on the trails, especially unleashed. I’ve been biking a few times and nearly gone way off the trail to avoid colliding with a four-legged friend, and if I were to be on a horse, I’m not sure how pleased I would be to see an unleashed dog come bounding toward me. I suppose it also kind of depends how much you mind the presence of others – people and canines alike – when you’re wandering up some hill, escaping from the world. But I’m not a dog owner so I can’t say I have the strongest feelings about this, one way or the other. Plenty of people do, though. What do you think – are dogs – unleashed or leashed? – a good idea on hiking trails? Comment below, if you want. Here’s a link to the formal rules. Click here for the news story on the proposed dog rules. I didn’t see anyone comment on the issue of poison oak. Many dogs will play in poison oak while on the trail and I have had many unleashed dogs then come up and rub against me because their owners did not have them trained well enough to prevent this behavior. One year I had to miss a couple weeks of work and endure terrible pain because someone’s unleashed dog gave me a terrible case of poison oak. I’ve also watched dogs attack and even kill small wildlife in California parks. I’ve also seen countess dog owners not pick up their dog’s poop, which is damaging to the ecosystem. I’ve also seen parents’ look of horror on their face when an unleashed dog runs up to their child’s stroller and pokes its head in. We wouldn’t except the parent to remain calm if a stranger they didn’t know came that close to their infant. So, I don’t agree that the dog owners can be trusted to managed their pets. I think animals should have to obey the same laws as people. Take only pictures, leave only footprints, not poop or dead animals they’ve killed or maimed. And if a person came up to me and rubbed poison oak on me or sniffed my private parts that would not be acceptable, so why do we tolerate this behavior from dogs? I like the last person’s comment. All dogs on leashes, unless you’ve demonstrated through training and a permit that you have a dog that can obey rules, not scare anyone, not pollute and not destroy the ecosystem. Your dog does not have the right to compromise another person or animal’s health and safety, anymore than you do. I’m depressed because I can’t find a park where I can walk with my best friend/protector/scout, so now I’m supposed to walk alone? More people have done damage to me that any dog. It’s the wild? They’re leashed anyway. So we take away the land and so where do they go now? Either confined to a leash now, just around the camp area, but not on the best parts. Seems to defeat the purpose of enjoying nature and being with someone with a better sense. We’re a democracy, we’re supposed to have freedoms, but we keep on taking our freedoms away and nowadays I’d cross the border and accidentally break a rule. Pretty soon they’re going to keep them off the sidewalks. Denver used to be a great dog city, but it lost it’s charm when it started confining them to spaces. I have common sense, I’m a good dog owner, my dogs are friendly and have even been helpful on trails, but I really miss the good old days. I agree with the soldier and I’m a vet. People are more dangerous than dogs. How much space do we need and need to constrain and prohibit every other living thing? I’m not even a hippy. Most of these people sound like they have OCD, are micromanaging everyone, and must have control over everyone and everything at all times….they sound like nags and very uptight. Just live! Pecking Order! Now you insult cats. My horse is superior to your dog. Do you even pick up your own horse feces? We’re treating the national parks like it’s the city and our dogs came from the wild. Have happy micromanaged lives together and enjoy loosing your precious freedoms. Every time I go overseas I remember the precious freedoms and things that the U.S. started banning because we’re so paranoid about being sued. The parks are too boring and lack seesaws, my niece looks ridiculous and too tall for the required booster seat. Not that I break the law or even swear, or drive around drunk or anything, though I strongly prohibit it, but I was looking at this beautiful stairway overseas and thinking “how beautiful this is, but in the U.S. people would fear of building this because someone would fear getting sued.” I’m even politically correct. Wyomingite seems to have a huge obsession with dog poop. Don’t get me wrong, I don’t go to off leash dog parks and try to avoid trails where dogs are off leash just simply because dogs are dogs and aren’t always necessarily going to get along but that Wyomingite seems to be a dog hater to me. Just stay away from me and my dog with your hateful crap spewing out of your mouth. Wyomingite is the only commenter here who used 100% reason. Mari and others used feelings to support their positions. Amy Luna, who I attended college with, made important points and also talked about her fear. I’m really curious about how dog owners will react to me sniffing their crotches, running up to them and yelling in their faces, and crapping near them. Point is, unleashed dogs are an imposition on everyone else around. There’s no excuse for an unleashed dog. If your unleashed dog invades my space, I’m going to react just like you would if I invaded your space: A violent application of force, whether it’s a stick, boot, knife, or bullet. Your dog has zero right to be on me in any way. Don’t like that? Keep him on the leash and off of me. I stumbled upon this trying to find legitimate data on the reasoning behind banning dogs from state parks and I find a lot of angry people in both camps. Hiker Joe, I wonder if your posturing also occurs with people? Even though I whole heartily agree with you on leashes, I do not know if a “violent application of force” is the answer. However the prize goes to Wyomingite. Identifying statistics from web results from Google does not really make you an expert. Here is the link to the PDF you are citing for many of your points. http://wwwnc.cdc.gov/eid/article/17/2/pdfs/10-1070.pdf. However here is link to rebuttal of Chomel’s paper. ‘ http://www.animalmedcenter.com/news-and-press/article/the-risks-associated-with-sleeping-with-your-pet-are-overblown-and-exaggera ‘ . The important thing in this study is number of actual cases versus the number of actual pets, which is glaringly absent and extremely low. Back to my original reason for coming to this site. What data and research substantiates the need to keep dogs out of the ecosystem? Man has had very long history with canine, many of those years in the wild. The have played an important role in protecting and assisting in keeping mankind alive. It is laughable to label dogs as a predator. Kind of calling the kettle black if you ask me. I have two miniature huskies and yes, they would chase wildlife, as they do when Raccoons and Opossums come looking for food near our house. They also chase our four cats, but (gasp) they all sleep together on the bed. However, I never take my dogs off their leashes and ensure that I always bring poop bags with me, as well a bottle of water, treats and anything else to make our little nature journeys enjoyable. But I realize that not everyone enjoys my little furry kids as much as I do, and always make sure distance is kept between me anyone that is not sure, or fearful of them. So I am asking, what real evidence do we have that dogs disrupt the ecosystem and wildlife habitats? If we were truly responsible, we would cordon of these areas from everyone and everything. Dogs should be banned on all hiking/mtn biking/cross country ski trails and beaches – with the exception of a few “token” trails for those kind of people who think they will die if their dog is not with them every minute of the day. Dogs should especially be banned on city parks that are home to baseball and soccer fields. Dogs poop. Dogs charge. Dogs bark. Dogs are aggressive. And dogs RUIN the experience and joy of being outside for the non-dog owner. I don’t like to be going downhill on x-country skis and have a stupid unleashed dog run up and try to bite me. I don’t like to be in my wetsuit going for a surf and have dogs run up at me and snap their jaws an inch from my body. I also don’ like it when I play baseball and dive for a catch – and there is dog crap in the outfield. I also don’t like trying to relax at a city park and hearing the dogs bark constantly from behind a chain link fence. I could go on and on with more examples, but I think you get the point. I hate your dog. So does most other people. Keep your dog at home. I also do NOT want to get rabies, so I bring a used golf club with me to save my life from a dog attack. Please stay home with your dog. Everyone else in the universe will thank you. and yes, we all know how much of a “tough guy” you are with your big truck and your even bigger fat gut. In short, dog owners are the worst kind of people in America.